Big Finish: BLAKE'S 7, 1.3 – DRONES Review | Warped Factor - Words in the Key of Geek. Andrew Smith’s Battleground, the story immediately previous to this one, had characters in an extreme situation on the Federation troop training planet of Straxis, as the Liberator crew looked for a scientist crucial to the development of a Federation version of Orac. Marc Platt’s ‘second half’ of the story involves a return to Straxis, and is actually rather more apposite today than it was when it was released two years ago. More apposite because drone warfare has gone from being ‘an idea that’s coming soon’ in 2014 to an idea with which we’re all terrifyingly familiar in 2016. Platt’s focus on drones as the chief threat on a different part of Straxis, where the Liberator crew are driven after more space-based conflict, was prescient, and his core idea of drones that bite, infecting their victim with a virus that excites the cells of their bodies to the point where they overheat and explode, while the drone itself sits and watches, recording the process for scientific reasons, is both elegantly simple and horribly sick, in exactly the right way for the Federation and its pathological refusal to waste resources. Where Platt’s half of the Straxis tale is possibly less successful is in his rendering of characters. While in Smith’s half, we got Voss Ferrell, an overwrought, spoilt, misogynistic spite machine, played by Dan Starkey like a far more hysterical Strax, Abigail Hollick as Alexa Mikolov, whose existence within the play seemed to be centred on driving Ferrell up the wall, and Tim Bentinck as Abel Garmon, a potential ally of Blake’s cause and a good soldier, in Platt’s continuation of the adventure on Straxis, Sara Powell as Dr Cara Petrus is the voice of reason, while Tim Treloar as Bru Renderson is, in a way, the anti-Garmon, becoming more and more disillusioned with Blake and his team as the story goes along. There’s a validity within the world of the story there, Renderson originally being something of a Blake fan, and degenerating after having met him and realising that the meeting hasn’t been engineered by the actions he himself took, but by the fact that Blake is still looking for Garmon. It’s a kind of ‘never meet your heroes’ allegory, and there’s a degree of sense to it. There’s also a solid story-strand in the flipping of the narrative – Garmon had heard of Blake but never especially pinned his hopes on him, with the result that he impressed the freedom fighter enough to make him come back to look for him. Renderson is actively trying to contact Blake because he’s a man in need of help or rescue, and when he finally meets him, he’s less than impressed. It’s a story-strand that speaks to the division we can now see in many narratives of war, but which was still a relatively new thing back in the days when Blake’s 7 was on TV – at that rather less cynical point in time, there was still a degree of blind faith in politicians, with perhaps only the Vietnam War having led people to question the narrative of good and bad that their leaders put out into the world. On a planet in the post-Thatcher-Reagan era, and especially the post-Bush Junior-Blair era, the people of most Western nations are rather more circumspect about who the good guys and bad guys are in any conflict, and Garmon and Renderson work as two bookends of public opinion about Blake and his revolution. More specifically though, the two work as reflections of the different pressures of different types of warfare. Garmon’s war is more traditional – tanks and air strikes, in which, despite the grimness and the likelihood of eventual death at the hands of would-be Federation troopers, there is time to think, time to breathe, and time to sleep. Renderson’s war is fought against things the size of a gnat, that could be there at any time without being noticed, and which, if they bite you just once, have sealed your death warrant. It’s a more strung-out, paranoid, exhausting kind of warfare, and it informs Renderson’s personality and decisions throughout the play. There’s a moral there, as we move into the era of drone warfare ourselves. The arguments in favour of drones are that they take your own warfighters out of immediate danger and are effective against enemies who are hard to reach or hard to precisely kill by conventional means. The arguments against them are that they take the risk out of the process, and so can be deployed with less and less care, for less and less good reasons. Platt’s storyline shows us the dehumanising effects of drone warfare – the drones are self-operating, released en masse and left to do their job, while those against whom they are deployed have to live with the threat of death every minute of every day until it comes for them. To borrow a line from a Dalek, that’s not war – that’s pest control, which is a morally deficient way of thinking about any other human being. Besides all the deep and meaningful business of Drones though, its intention at heart is to be a dramatic, exciting Blake’s 7 story. In that, it half succeeds, by putting one of our Liberator favourites on the receiving end of a drone bite and starting the clock ticking before, in this instance, Villa becomes a big squelching bang and a lot of raspberry jam. In case the abstract fear of the drones and their impact doesn’t hit you, bringing it down to the specifics of our hero crew makes the drone danger something we have no alternative but to invest in. That said, the story spends a lot of time focusing on Renderson snarling and gritting his teeth, becoming increasingly disillusioned with Blake and his revolution as it becomes clear that Blake won’t be dictated to, even in cases where what Renderson wants is to be saved from inevitable death. And yes, in Drones, this focus on the storyline of Renderson’s disillusionment takes some of the drama away from the race to save Villa’s life. But on the other hand, in terms of an additional pulse of storyline, you could do a lot worse than Platt does in Drones by bringing Alistair Lock front and centre as Orac. In the TV version, the combination of Paul Darrow’s Avon and Peter Tuddenham’s impatient, self-important Orac was often a source of spiteful joy and laughs, and here we see that relationship renewed as a priority for the first time, Lock giving Orac the same sense of being the most important thing in its own universe – a particularly delicious conceit when it takes over Zen and the Liberator, as while Blake goes into full-on panic mode, when they’re alone, Avon gets to calls Orac’s bluff – it’s scared that the Federation’s version of itself is out there somewhere, and possibly, quite possibly, it’s stronger and better than the original. Rather than simply being there to re-establish this double-act of Avon and Orac though, this thread has a direct impact on the story, making the crew return to Straxis, and eventually providing the solution to the drones – though if you’re expecting a story in which everyone makes it out alive, you probably haven’t been watching or listening to the right dystopia. 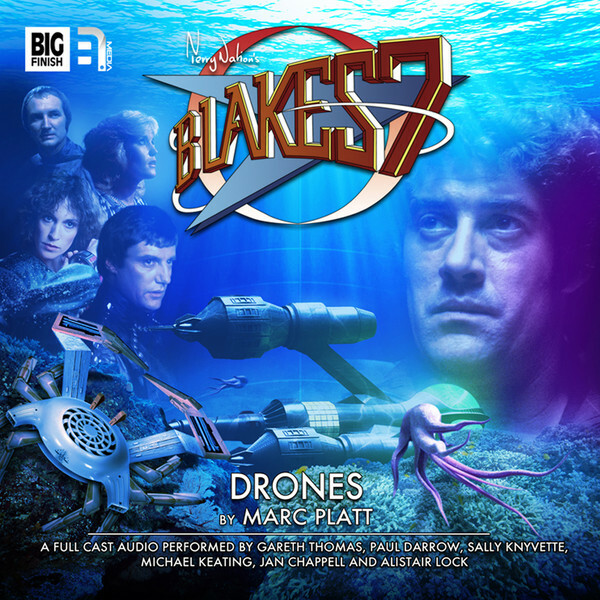 As an addition to this first series of full cast audio Blake’s 7 stories, Drones is a story that seems to include a number of Marc Platt ‘tells’ – big ideas, solid scares, a sense of timing driving the story along, but perhaps rather less in the way of focused characterisation to make it a gripping or especially enjoyable entry into the overall story-arc. There’s plenty to keep you listening to Drones, but some listeners might get bored of Renderson’s eternal bad mood and griping stealing quite so much focus from the potential of Villa fighting for his life and Orac coming to the eventual rescue – once it’s finally been convinced that one of the human crew is worth, essentially, getting out of bed to save. There’s little enough wrong with Drones to make it absolutely worth listening to, but whereas 1.1, Fractures appealed instantly to fans of Tanith Lee Blake’s 7, and 1.2, Battleground, appealed directly to fans of Chris Boucher Blake’s 7, Drones, if anything, reminds us of Terry Nation’s original, the Federation feeling like more of a faceless Orwellian nightmare than it would eventually become, and there being perhaps just a little too much pontification getting in the way to allow the well-planted seeds of the drama to achieve their full flowering.